A general rule: foods that grow together go together. Likewise, harvests that come to market at the same time of year often make the best combinations. 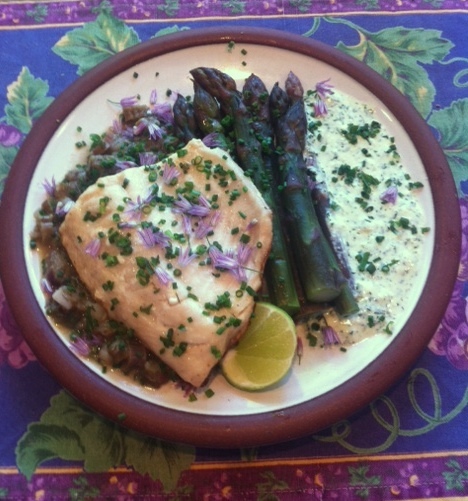 This marriage of seasonal produce was a happy occurrence for us the other evening when I paired local asparagus with fresh whitefish just in from Lake Superior. Most of this past winter the Great Lakes were frozen over; fishing came to a halt. Spring now offers abundant, juicy whitefish. If fresh wild-caught whitefish might seem uninteresting, with a proper hand over the pan, these fillets are succulent fare. Before we get to the fish, which will cook in six to seven minutes, let’s consider the asparagus. You’ll want to use every morsel of this treasured local crop, so plan to quickly blanch the top six inches of each spear and slice the lower segments for a vegetable braise. Combined with onion, a small potato, garlic, a little chili and fresh herbs, the tender braised asparagus will form a base for the quickly sautéed fish. Meanwhile, the blanched asparagus spears, lightly glazed with butter or olive oil next to a pool of yogurt mint sauce, will complete the plate. Add a sprinkle of fresh mint and some chive flowers for something better than restaurant fare. Lake Whitefish, a freshwater fish that’s a subfamily of the salmon, are indigenous to our North American Great Lakes. They usually come to market as skin-on fillets (though if you ever see whitefish whole, they are excellent baked or grilled; bone-in fish always have more flavor and nutrition than fillets). The skin may be eaten; it’s delicious. Gently sweat the onion, garlic and chili in 1 tablespoon olive oil in a medium saucepan. Add diced potato, chicken stock or water, asparagus ends, salt. Cover and cook until potato and asparagus are tender. Add fresh herbs and simmer a few more minutes. Taste for seasonings, adding a little lemon juice if you have no sorrel and a spoonful of cream for luxury. Set braised veg aside on a warm corner of the stove while you blanch the asparagus tops and sauté the fish. The asparagus will cook perfectly in three minutes in boiling, salted water. To sauté the fish heat a heavy cast iron skillet and film it with half a tablespoon oil. When the oil shimmers with heat, sprinkle the top of the fish pieces with kosher salt and dredge the skin side in season flour. Shake off any excess and place fish skin side down in the hot oil. Allow the fish to cook for 3–4 minutes or until nicely browned underneath. Reduce heat to moderate, cover and cook another 3 minutes or just until the top loses the raw look, turning opaquely white. While waiting for the fish, roll the cooked, drained asparagus in melted butter or olive oil. To serve, mound a spoonful of the braised veg on the plate top with a piece of fish and lay asparagus spears at the side along with a pool of yogurt mint sauce. Enough for 2–3.